The TH-2250-VF is the ultimate streamlined wall mount for screens weighing up to 110lb. This sleek design holds the display 0.65" from the wall, creating a seamless display that melts effortlessly into the decor, as if it were part of the wall itself. The TH-2250-VF has the added bonus of four security screws for theft resistance. 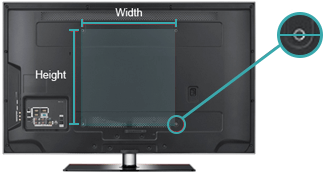 It's easy to install and can support three different VESA mounting hole patterns, which gives you a much greater choice of display compatibility.